Sunset Over Houston-Downtown2 - This was another capture of the Houston skyline. Capture this aerial image of Houston Skyline right as the sun was setting and as it was going down it started to back light these wonderful clouds over the city with these wonderful colors of orange, pinks and yellows. Houston is a large city with a population around 2.3 million people which makes it the fourth most populous city in the US. 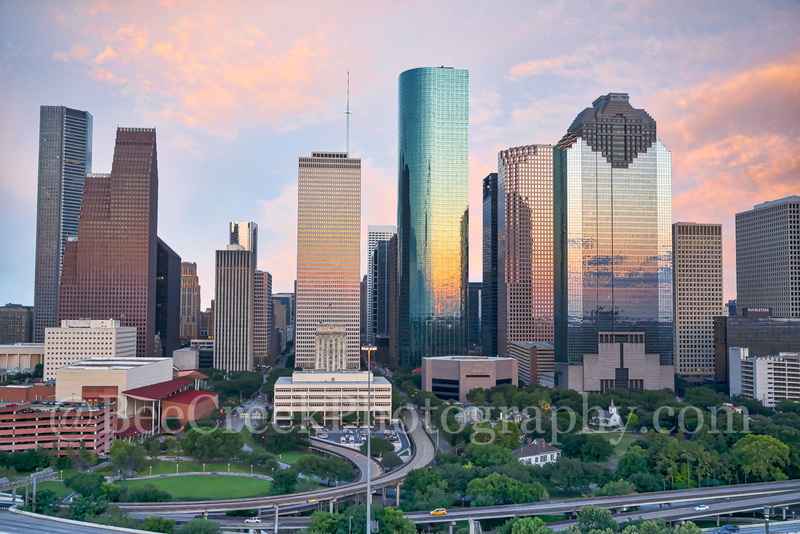 Houston is also the largest city in the southern united states. The skyline of Houston is very impressive site with some of the tallest and modern skyscrapers buildings in the US. In this image you can see the Heritage Plaza, Wells Fargo and the tallest building in Houston the J P Morgan Chase Tower at 1002 ft and it the 17 tallest in the US. This urban area almost always has something going on and today we capture a great sunset over the city . Photo © copyright by Bee Creek Photography - Tod Grubbs / Cynthia Hestand.